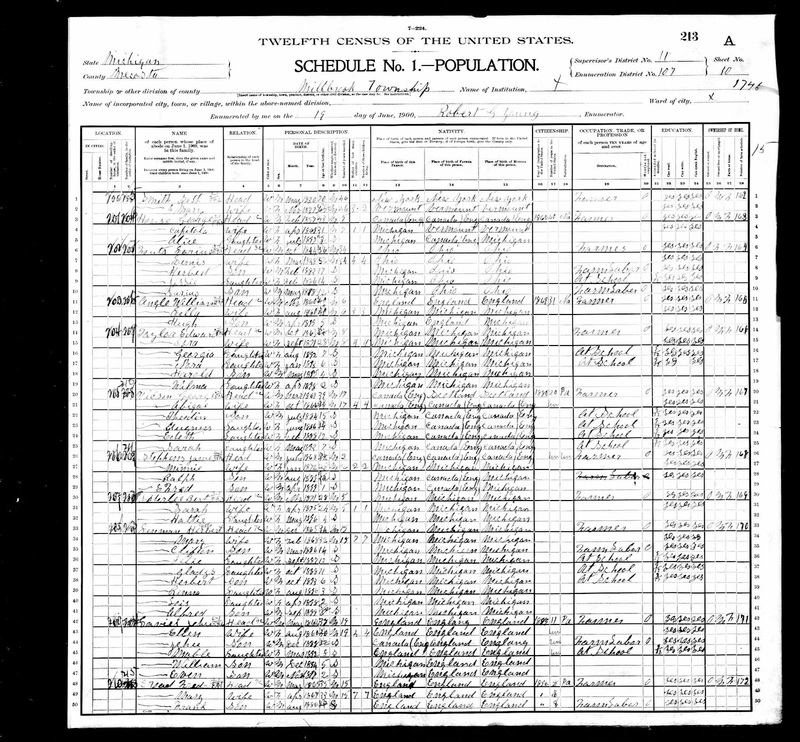 I'm counting down my great-grandparents in the US census and this week is 1900. 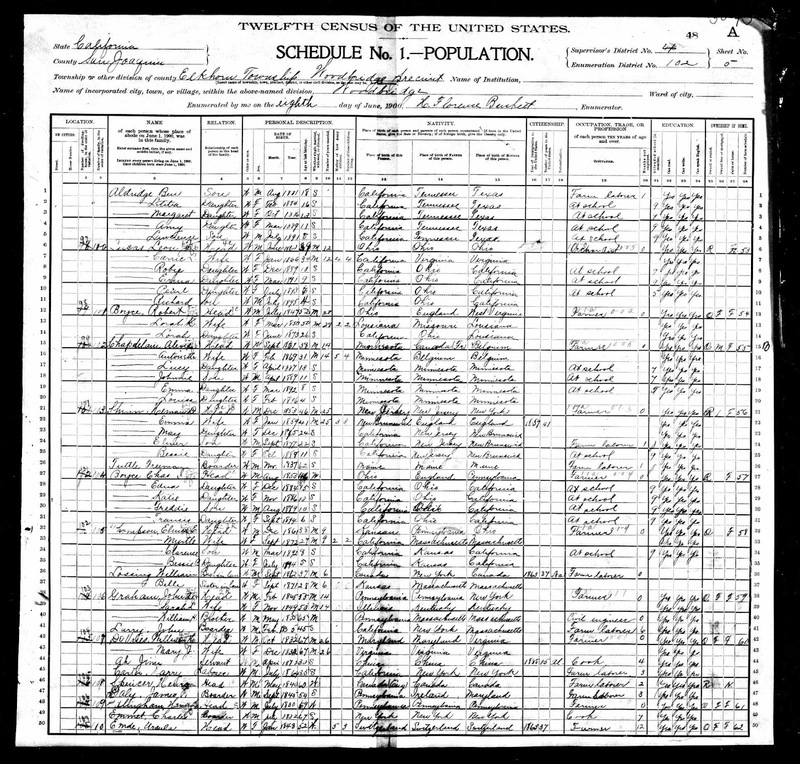 This is the last census where all of them were alive and enumerated. 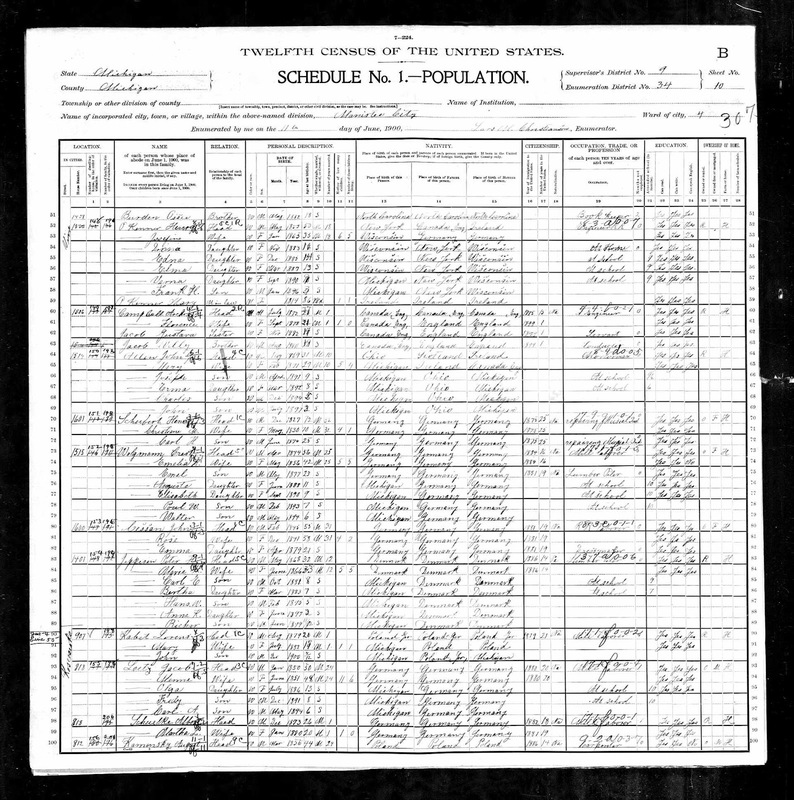 Most were born in the 1890s so this is also their first census. 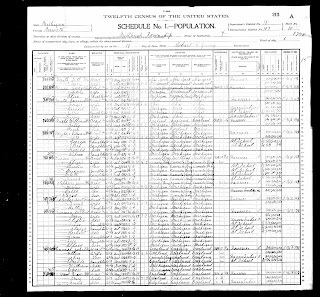 One was born in the 1880s and would have been in the 1890 census if it had survived. One was born in the 1870s and was enumerated in the 1880 census. 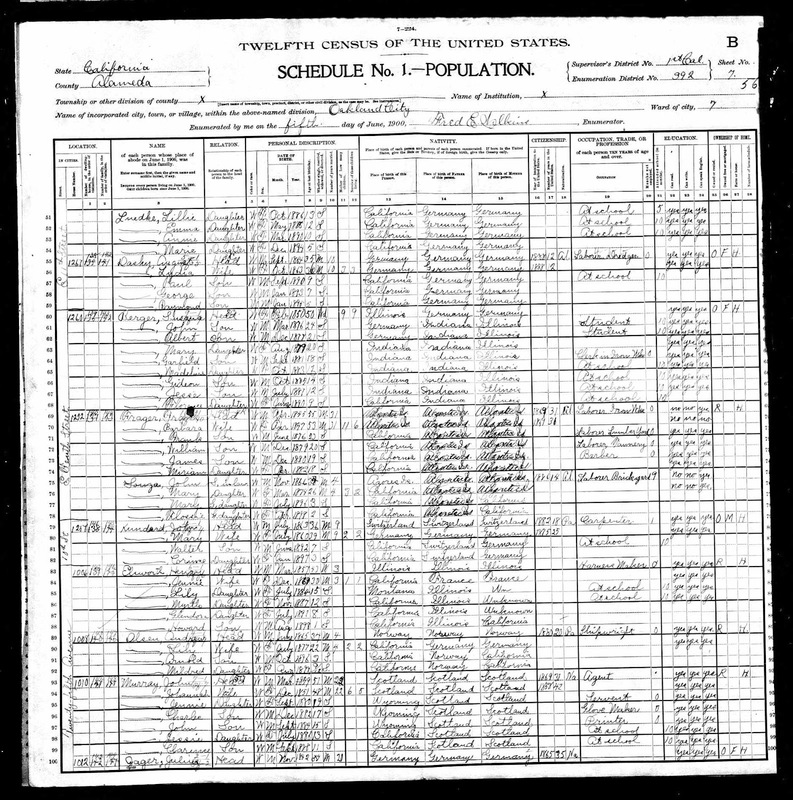 The only greats not enumerated in the 1900 census are my paternal grandmother's parents who were still in Italy. My great-grandfather, Joseph James Allen, and his family. They were living at 1514 Vine St. in Manistee, Manistee, Michigan. 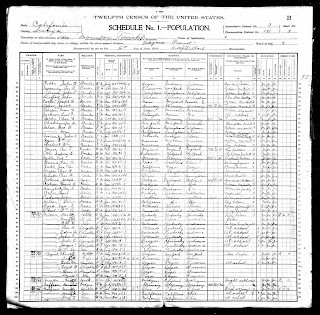 1900 US Census, Manistee County, Michigan, population schedule, Manistee Ward 4, enumeration district (ED) 34, p. 10B, dwelling 150, family 193, Joseph Allen (son); digital images, Ancestry.com (ancestry.com : accessed 11 June 2011); NARA microfilms publication T623, roll 728. My great-grandmother, Daisy May Croad, and her family. They were living in Millbrook, Mecosta, Michigan. 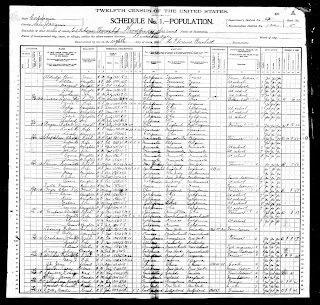 Daisy and most of her siblings were enumerated on the subsequent page, their parents appear on the page to the right. 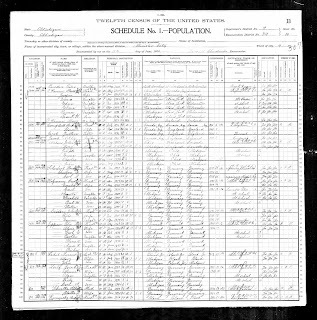 1900 US Census, Mecosta County, Michigan, population schedule, Millbrook, enumeration district (ED) 107, p. 10B, dwelling 210, family 215, Daisy Croad (daughter); digital images, Ancestry.com (ancestry.com : accessed 13 June 2011); NARA microfilms publication T623, roll 731. My great-grandfather, Elmer John Shinn, and his family. They were living on the family farm in San Joaquin County, California. 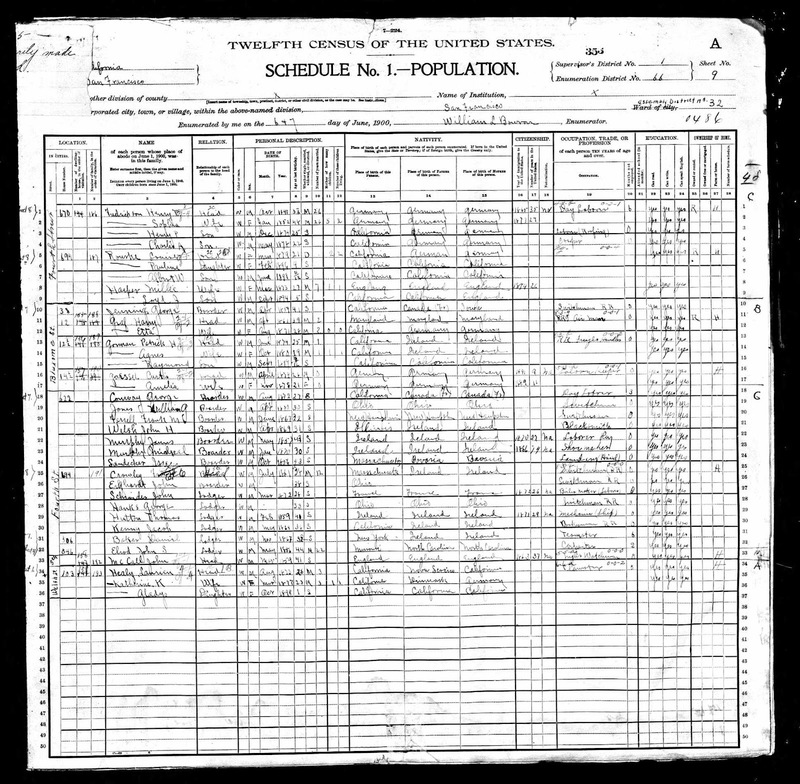 1900 US Census, San Joaquin County, California, population schedule, Elkhorn, enumeration district (ED) 102, p. 5A, dwelling 100, family 103, Elmer Shinn (son); digital images, Ancestry.com (ancestry.com : accessed 27 June 2011); NARA microfilms publication T623, roll 108. My great-grandmother, Gladys Viola Healey, and her family. They were living at 103 Welsh St. in San Francisco, San Francisco, California. 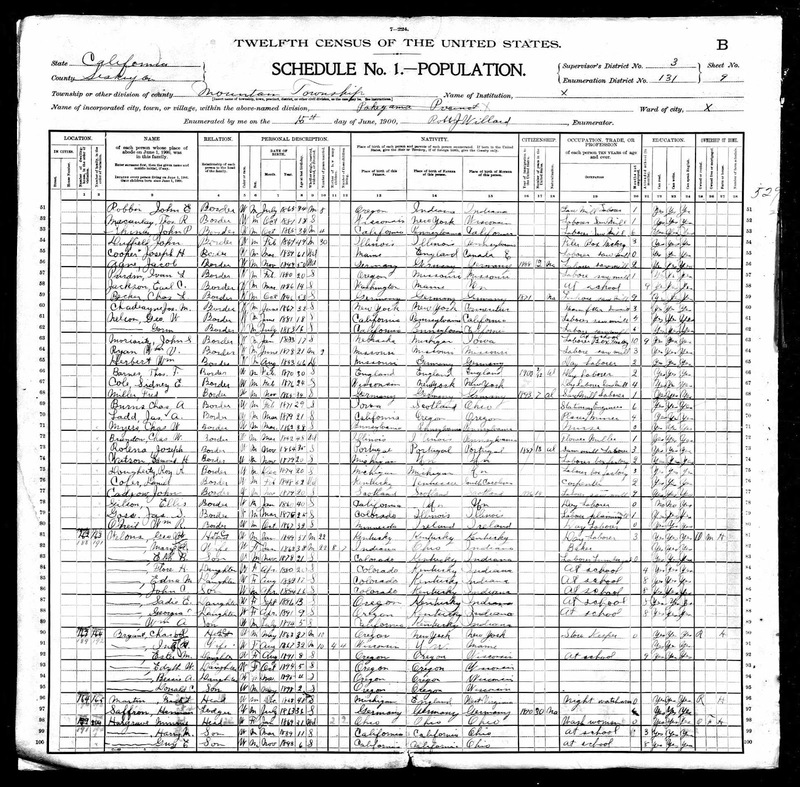 1900 US Census, San Francisco County, California, population schedule, San Francisco, enumeration district (ED) 66, p. 9A, dwelling 159, family 193, Gladys Healy (daughter); digital images, Ancestry.com (ancestry.com : accessed 27 June 2011); NARA microfilms publication T623, roll 101. My great-grandfather, Gideon Gottlieb Berger, and family. They were living at 1260 E. 10th St., Oakland, Alameda, California. 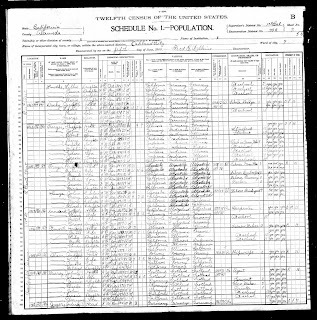 1900 US Census, Alameda County, California, population schedule, Oakland Ward 7, enumeration district (ED) 392, p. 7B, dwelling 139, family 143, Gideon Berger (son); digital images, Ancestry.com (ancestry.com : accessed 27 June 2011); NARA microfilms publication T623, roll 83. My great-grandmother, Georgiana Wellons, and her family. They were living in Mountain Twp., Siskiyou, California - which is now a part of Klamath National Forest. 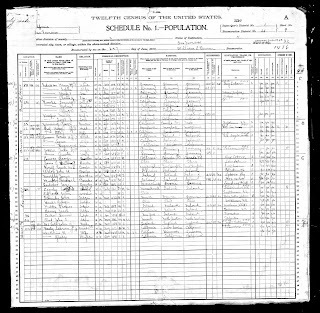 1900 US Census, Siskiyou County, California, population schedule, Mountain, enumeration district (ED) 131, p. 9B, dwelling 188, family 191, Georgia Welons (daughter); digital images, Ancestry.com (ancestry.com : accessed 27 June 2011); NARA microfilms publication T623, roll 113.